Local electronics giant Cherry Mobile is running its nationwide 'Payday Sale' starting today until the 16th of August - that's this coming Sunday. 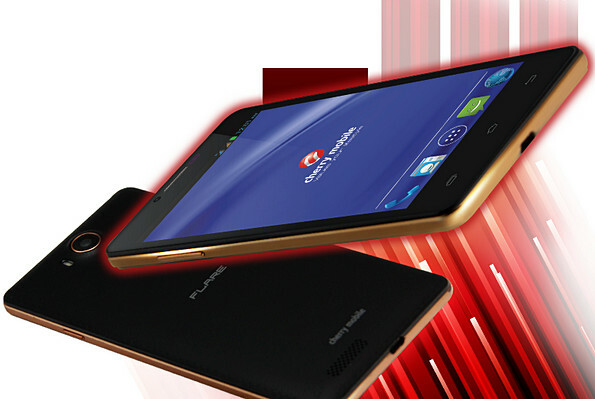 And one of the smartphones that you can grab for a lot less is the popular Cherry Mobile Flare S3 Octa! From having a regular suggested retail price of Php 4,499, CM Flare S3 Octa will sell for only Php 3,999 on those dates -- if my math serves me right. Just between us, I was told by an 'insider' that this particular model is Cherry Mobile's best-selling smartphone for more than six months now -- and understandably so. The handset comes with great technical specifications for a device in this price bracket and it also benefits from being a member of the company's well-received 'Flare' series; We call it 'halo' effect in marketing. The follow-up to the equally successful Cherry Mobile Flare S3 from 2014, this Octa Core version flaunts an elegant design identity highlighted by a thick faux metal accent running down its sides. In terms of specs, it is equipped with a 5-inch HD IPS display, 13 MegaPixel autofocus camera with LED flash, 5 MegaPixel front cam for selfies, Full HD video recorder, 3G HSPA+ support, and Dual SIM Dual Standby capability. At its heart, the smartphone runs Android 4.4 KitKat operating system with its 1.4 GHz MediaTek MT6592M chipset incorporating eight ARM Cortex A7 cores and a Mali 400 GPU, has 1GB of RAM for multitasking, and 8GB of ROM that can expanded via the device's microSD card slot. 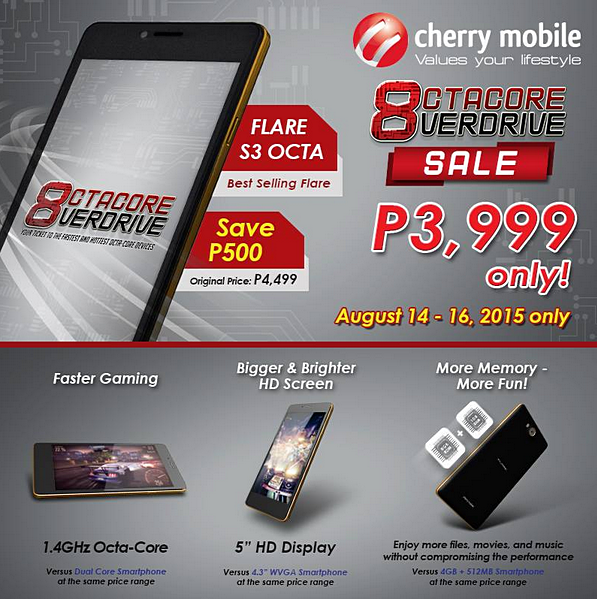 You may avail of Cherry Mobile Flare S3 Octa for that discounted amount at all Cherry Mobile Concept Stores as well as participating kiosks and authorized retail outlets across the country.